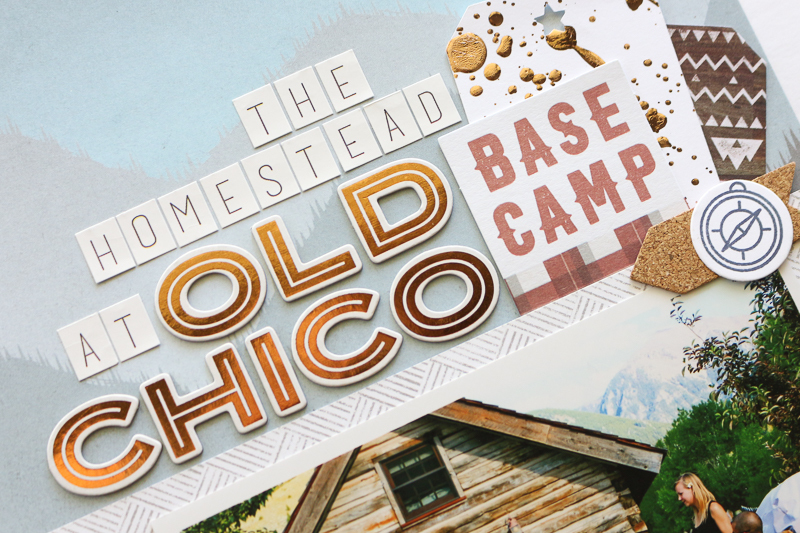 I was able to knock out two more pages for our Yellowstone album this weekend! Yay! 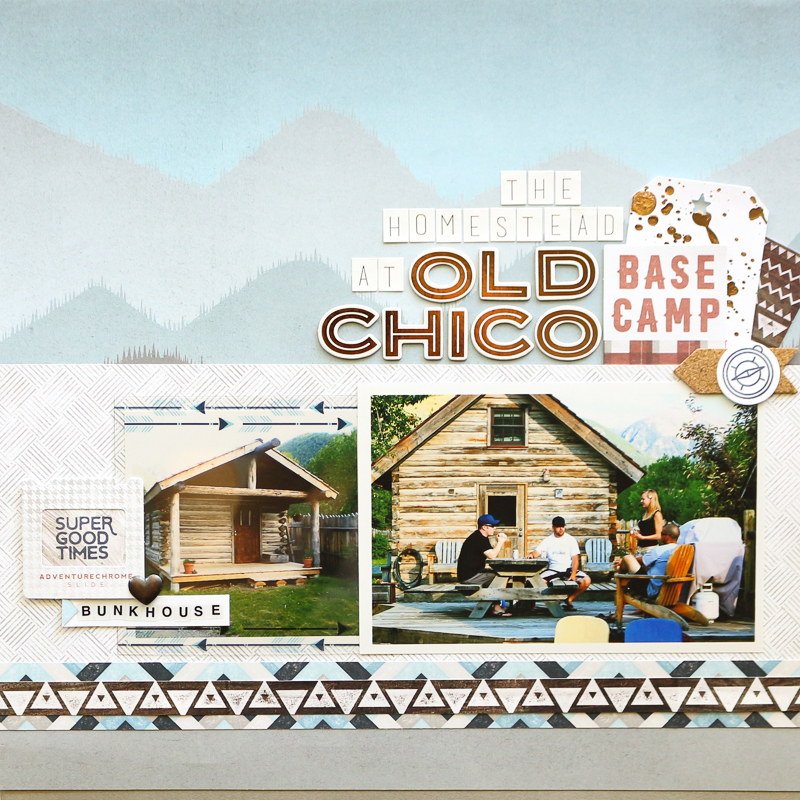 I'm feeling super inspired to scrap right now... which feels great after going through a few months of not really feeling like scrapping at all. Just the ebbs and the flows. 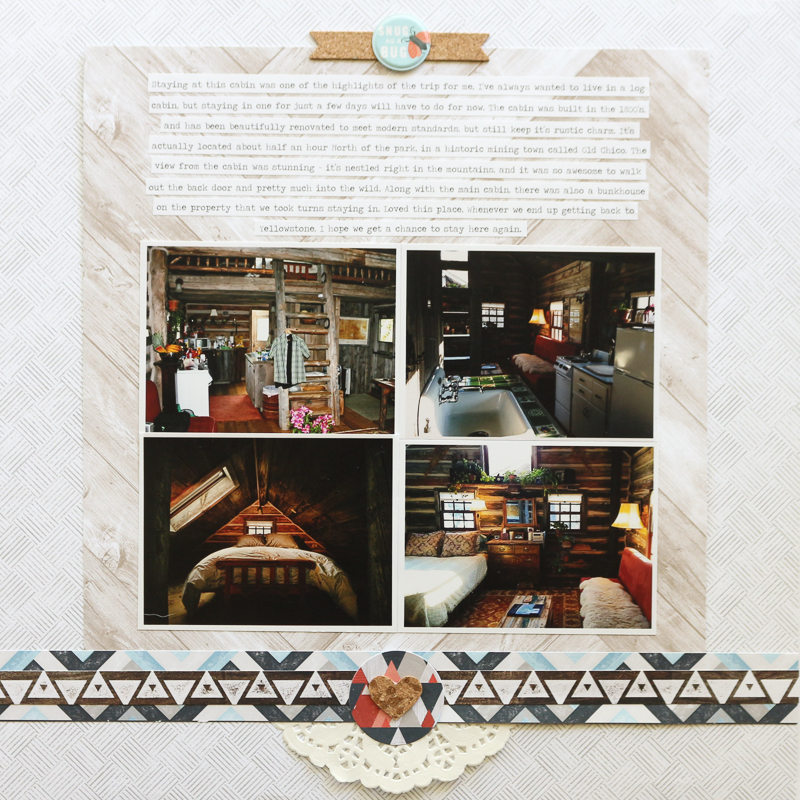 For this spread I documented the awesome little log cabin we stayed in for our trip. I loved it. It was one of the highlights of the trip for me. I will probably end up saying that about almost everything... haha! But this is a major highlight. I've always wanted to live in a log cabin (the Laura Ingalls in me, I suppose), so staying in one for those few days will have to do for me, for now! It was the cutest little cabin, that was actually built in the 1800's in Helena, then bought and moved to this area about 30 minutes outside of the park. It's been renovated to have modern necessities (running water, a shower, etc. ), but still keeps it's rustic charm. I loved it. It is also nestled right into the mountains pretty much, so stunning scenery all around it. I hope that whenever we end up making our way back to Yellowstone that we are able to stay in it again. Anyways, onto the page. 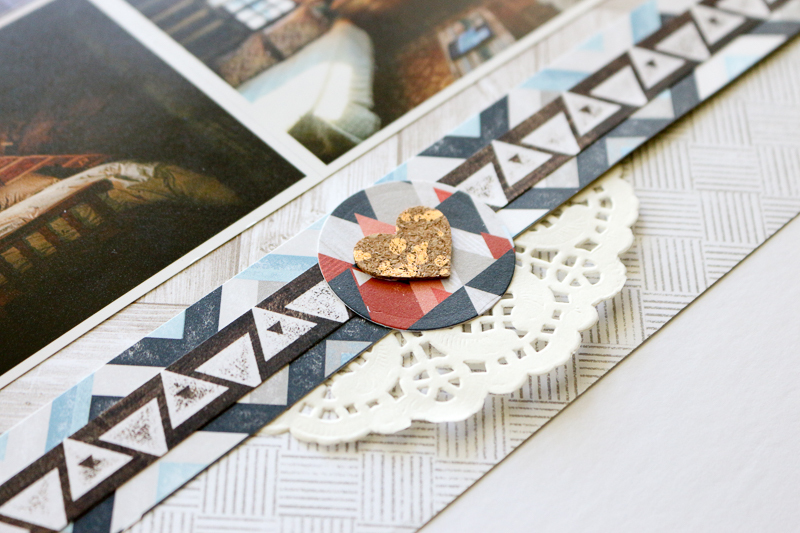 After seeing this page by Mary Ann Jenkins on the Paper Issues blog, I knew that I would have to scraplift it. I love that mountain paper from the Pink Paislee Outfitters line, but didn't really know how to use it. 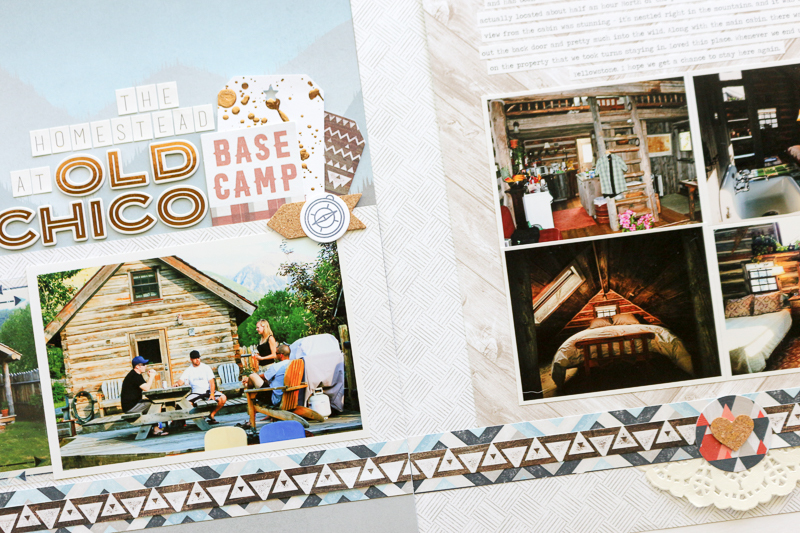 Once I saw what she had done, I thought a similar design would work out great for my cabin photos, and I love how this spread has turned out! I love the copper/rose gold accents in this collection, and LOVE those Thickers. I have also been having fun with the Heidi Swapp Minc Reactive spray mist, and foiling a bunch of stuff (tags, doilies, cork embellishments) to add to my pages. I highly recommend the reactive spray mist - although it doesn't spray very well (and I have read that is just the way the spray is, not that my mister is defective or anything). It kind of shoots out in a stream, not really a mist. But I have just been dropping/flicking the liquid onto my pieces, and am loving how it is turning out! I used it on the tag in the picture above. 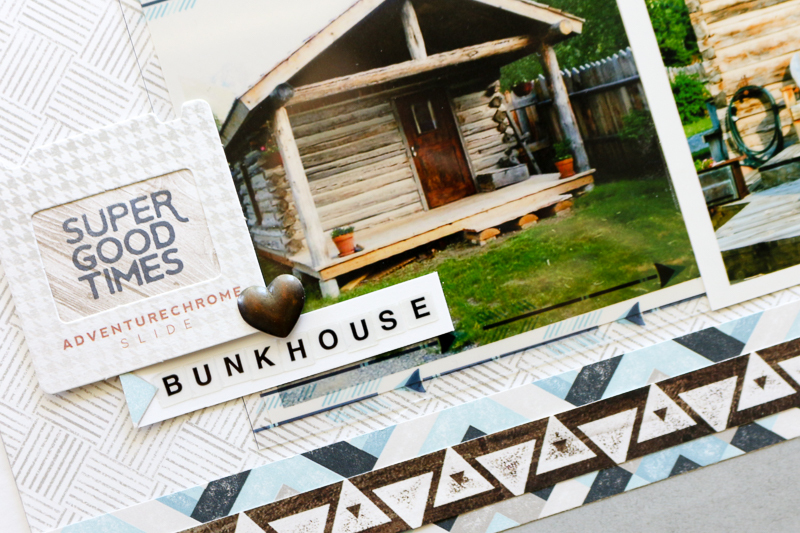 I'm also trying to fit in some Ali Edwards 'Wild' Story Kit and Stamp products wherever possible (the "Super Good Time" stamp above). Another example of using the Minc Reactive Spray on the cork heart. I wasn't sure it would work on the cork - I thought it may absorb the spray too much - but it works wonderfully!